This flavorful herring was inspired by Lelov (Leh-Love). Rav Dovid of Lelov (1746-1814) was the first Rebbe of this holy Chassidus. He was born in Biala, Poland and was a student of the great Chozeh M’Lublin. The Chozeh said about Rav Dovid: “He is the foundation of all the tzaddikim and all the leaders of the Chasidic movement.” Rav Dovid was famous for his love of all Jews, even the wicked ones, always finding ways of defending them. He used to say to his followers, “How can you claim that I am righteous, when I know that I still love my children and grandchildren more than I love my other fellow Jews?” It once happened that his son fell seriously ill. Anxious for his welfare, the townsfolk assembled to pray for his recovery, and spared no expense in hiring the most expert physicians. When in due time he recovered, they expected to see Their Rebbe, R’ Dovid, rejoicing, instead they found him weeping bitterly. Rav Dovid said to them: “When my son fell ill, everyone was concerned; praying, and doing whatever was necessary until he was well. But if any other person is sick, no one makes a stir about it – people do not pay nearly that much attention to him. Now is that not something to weep over?” Rav Dovid was well versed in the mystical aspects of the Torah and maintained a strong connection with his Rebbe regardless of the distance. Lelover Chassidus soon migrated from Poland to The Holy city Yerushalaim when Rav Dovids son, Rav Moshe of Lelov, moved there shortly before he himself passed away in 1851. Even with the great esteem many had for Rav Dovid, others considered him an ignoramus. But they only saw him on the surface, if they were to have truly appreciated the depth of Rav Dovid they would understand his great breadth of Torah knowledge. Similarly, this herring has a deep flavorful presence that takes a discerning palette to truly grasp. Today Lelov is continued by it’s three illsutrious Rebbe’s in Bnei Brak, Jerusalem, and Borough Park. Rav Shalom Dovber of Lubavitch, The Rebbe Rashab as he was known once said: “A Chassid creates an environment – an atmosphere.” By infusing ourselves with a desire to love all Jews unconditionally and greet every single Jew with a smile we create an atmosphere of love and warmth – we remove the pollution of arrogance and spite. We as Jews have this incredible ability to create an atmosphere of purity and holiness wherever we go. We can learn this out by taking a deeper look into the Purim story; the pasuk reads “On the seventh day [of the second party], when the king’s heart was gladdened with wine…”(Esther 1:10-11) In this moment of drunkenness Achashverosh called for Vashti in an inappropriate state. Achashverosh was drinking all the other days of this seven day party thrown for the citizens of Shushan. This begs the question; why his drunkenness was only mentioned regarding the seventh day of the party? Rava says in Megillah 12b that the seventh day of the party was also the seventh day of the week, Shabbos, thus the Jews were not in attendance. What difference does this make? For when Jews drink, when the Jews are present even in a negative environment, they remain holy, they say words of Torah, sing niggunim and words of praise thus rectifying the polluted atmosphere, raising it up to an atmosphere of holiness and purity. But when those who serve idols drink alone, their words are indecent – this is what happened on the seventh day. One guy said Midyanite women are the most beautiful, another dude claimed Persian women are the most beautiful, and then Achashverosh said: my woman – my vessel is neither and she is most beautiful. We – the Jewish people – have the ability to create an atmosphere and make it holy. We make an atmosphere in which HaShem wants to reside. Rav Dovid of Lelov was once praying next to a simple Jew, at the end of each verse in his prayers the simple Jew would say HaShems name. This piqued Rav Dovids interest, what was the reason behind this strange custom? He asked the simple Jew, “Why is it that you mention the name of G-d at the end of each verse?” The simple Jew responded that he was told that two yuds (“) were an abbreviation for HaShems name, and here, pointing to his siddur, each verse ends with two yuds (:) Rav Dovid explained to him that symbol is to indicate the end of a sentence, only when the two yuds are side by side, not one above the other, do they form the name of G-d. When two yuds – two yidden – are one above the other, that’s not an atmosphere where HaShem wants to be. But when two yidden are together, side by side, equal brothers that is the environment where G-d will let His Shechinah reside in. Creating this positive environment in which G-d will join our lives is the first task of our daily existence; we are the true environmentalists of the world. This Matjes based herring is deeply flavorful and fresh. With a striking balance of savor from the onions and a light heat from the Jalapenos the taste is something you have never experienced before. 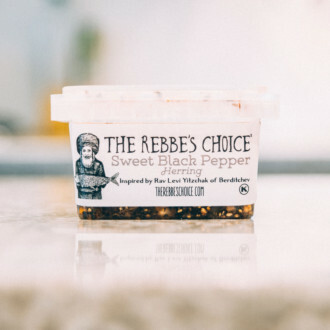 The Jalapeno Matjes is the flagship of The Rebbe’s Choice line of herring. Container Size: 12oz. 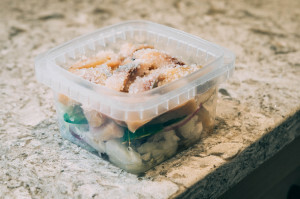 – about 20-30 pieces of herring per container. Ingredients: Herring, Canola Oil, Onions, Jalapenos, Salt, Spices.